Selous Game Reserve is the largest protected wilderness in Africa and is important because of its elephant migration routes, rare wild dogs, and vast herds of animals. 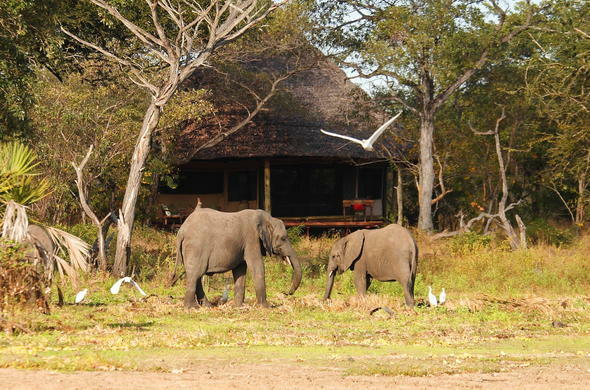 This Selous safari camp is situated on the banks of the Rufiji River in Selous Game Reserve, Tanzania. This reserve in Tanzania offers the perfect opportunity for riverboat game viewing and fishing. This is one of the most photogenic, wildlife-rich areas of the Selous Game Reserve, and during the dry season (June to October), concentrations of animals along the river is astonishing. African wildlife sightings can include zebra, wildebeeste, waterbuck, giraffe, impala, hyena, leopard, rhino, buffalo, elephant, lion, hippo, wild dog and more. This Tanzania lodge is designed to blend in with the scenery with thatched roofs on raised wooden platforms. They provide a homely look created by floor rugs, wooden furniture and an en-suite bathroom with an open-air shower. Each of the two camps at Siwandu Camp, North and South, has a swimming pool, which is a welcome respite in the heat of the day. Few destinations offer 3 entirely different Tanzania safari options but this safari camp in Tanzania is so well placed by the Rufiji River, a lake and the bush that you have a wide choice of activities in the reserve. Go by boat amongst hippopotamus and crocodiles and see amazing bird life. Travel in specially adapted 4x4 vehicles along the Rufiji River banks or get close to nature on bush walks along ancient paths trodden by elephant and buffalo. Due to the nature of this location, the baggage allowance on shared charters is 15kg per person, and this includes hand luggage. Soft bags are requested for easy storage. Any excess baggage will be left at airstrips. There are over 400 species of bird and the Big Five animals, Lion, Leopard, Rhino, Buffalo and Elephant, at Selous Game Reserve in Tanzania. Selous Game Reserve in Tanzania attracts the more intrepid and adventurous explorer as it is off the beaten track of the main tourist routes.